Today we go from the organic-looking Patience of earlier this week to the linear, Art Deco-inspired Nouvart tangle by Belgian CZT Ria Matheussen. Long ago, my husband and I visited Prague (capital city of the Czech Republic), a wonderful Art-Nouveau city in Europe. But also in Belgium we have a lot of beautiful Art Nouveau architecture, for example the Cogels Osylei, “the most beautiful street” in Antwerp and the Horta Museum in Brussels that we have visited recently. Art Nouveau started at the end of the 19th century and was based on nature. We saw so many organic patterns and fluid lines. After the Art Nouveau, Art Deco arrived: more stylized, tighter lines and geometric patterns. I like both of them and have read a lot about these fascinating movements in art. Unexpectedly, through these pictures, I found inspiration and created a new tangle: Nouvart. Ria shares the images inspiring her tangle. 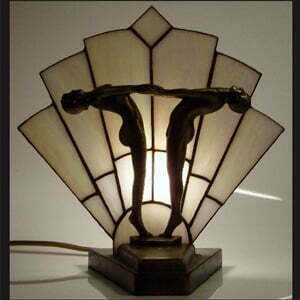 First, a classic Art Deco Frankart-inspired lamp. 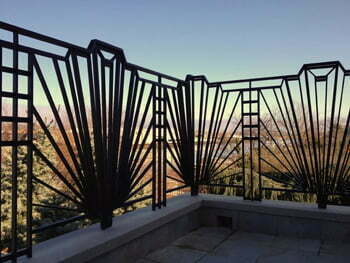 Next, a pretty landscape vista and an Art Deco lattice fence. 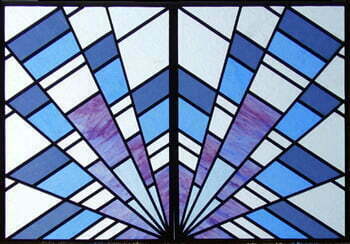 And finally, a lovely piece of decorative stained glass. My example of Ria’s Nouvart is a very simple version and though I rarely use it for my tangle examples, I used my Uni-ball Signo UM-153 White Gel pen to add the tiny orbs in the center of the diamond shapes. 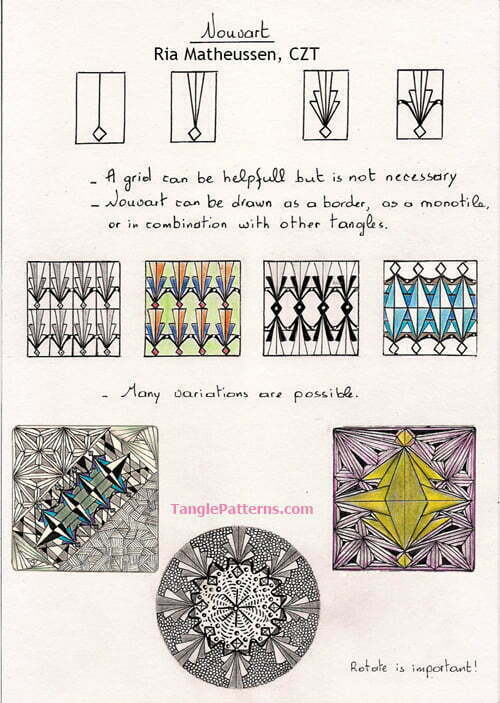 As you’ll see below there are many ways you can play and embellish this striking tangle. Ria illustrates the step-by-step instructions for drawing Nouvart below and she demonstrates several variations. As she notes, many variations are possible and she also reminds us to be sure to turn the tile. Ria, congratulations! This is really beautiful. I am definitely going to give this a try. Tons of possibilities..thank you! Ria, this is a keeper for sure. I too love anything Art Nouveau, so I know I am going to love this pattern of yours, thanks for sharing! Dear Ladies, Art Nouveau and Art Deco are wonderful periods in the Art. There are still possibilities to get inspired for creating new tangles. I thank you very much for your nice comments, I’m glad you like this pattern and I wish you succes! Another art nouveau lover thanking you for this lovely pattern. One line at a time! I am also an Art Nouveau and Art Deco lover. Would love to find out about other tangles in that theme. Thank you for sharing Nouvart! Dear Anita and Wanda, thank you very much for your nice comments. I hope you will enjoy drawing Nouvart. Dear Malvine, thank you for your nice feedback. I’m sure you will find more tangles, inspired by Art Nouveau and Art Deco. Especially some of the organic ones, remind me of that period. I wish you success on your discovery trip trough the wonderful world of patterns! Oh lovely! I have been playiing with this one, from your blog, Ria. It’s a lot of fun, and there are lots of patterns that go well with it. This is beautiful. I love how you captured the beauty you experienced on your trip. Ria, since Art Nouveau and Art Deco are my most favorite styles of art, I know that I am going to love this tangle and use it often. Thank you so much for sharing Nouvart. It is much appreciated. Dear Heidi and Paula, thank you for your sweet comments, they really make me glad. I hope you will enjoy Nouvart and I wish you succes, keep on tangling! Thanks for the share. This looks like a fun one to play with and many variations too. Dear Lezli and Sue, thanks for your lovely comments. I really hope you will have fun while using this easy and pleasant tangle and I know you will find more variations on it, wish you luck and keep on tangling! now thats how u tangle!! Dank je wel Bruno, dat vind ik nu echt eens tof van je en ik apprecieer dit gebaar ten zeerste. I’m going to use this one in my animation experiments. The final step of the how to Draw is a bit hard, but it will succeed. Dank je wel Bram voor je fijne commentaar, maakt me echt blij. In Zentangle mag je variaties aanbrengen op bestaande tangles, je hoeft die laatste stap er niet bij te tekenen. Je kan het patroon als basis gebruiken en ermee doen wat je wilt. Thank you for your nice comments Bram, makes me really happy. In Zentangle you can make variations on existing tangles, you do the last step does not draw upon. You can use the pattern as a base and do whatever you want. It was a nice surprise to see Nouvart on the database. Thank you very much for giving this pattern a try an for your wonderful presentation. Kind regards from Belgium and keep on tangling! Lovely tangle, Ria. I will be trying this one out for sure. Merçi Bernath, je suis heureuse avec des réactions et je vous souhaite plaisir avec dessiner Nouvart. Ria wat een mooie! Goed gedaan. Ik probeer het deze week zeker uit! Love art nouveau!! Big kiss.